History: The versatile Trevett, whose discography is filled with the biggest records of the last five years, is one of the rare mixers with A&R experience. 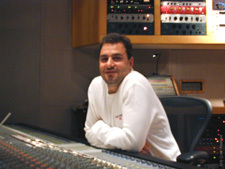 During his tenure at Jive, he did double duty as director in the A&R department and as a mix engineer, bringing his sensitivities to the artist¹s point of view and his musical sensibilities to bear on hit albums for Britney Spears, the Backstreet Boys and Joe. London-born Trevett began his mixing career in 1986 as an assistant at London's Battery Studios where he worked with and learned from producer Robert John "Mutt" Lange, mixer Nigel Green, Bryan New, producer/singer/songwriter Teddy Riley, Tony Platt and Chris Tsangerides. Two years later, Trevett moved back to New York City, where he had spent his teenage years. As a mixer at Soundtrack Studios, he again worked with Teddy Riley on numerous projects, including Guy's platinum album, The Future for which Trevett mixed three songs including, "Let's Chill." Trevett also worked with arranger/producer Dallas Austin on Boyz II Men's multi-platinum album, cooleyhighharmony. In 1991, Trevett signed a long-term production/management deal with Zomba/Jive, the management company and record label, where he remained for 11 years. At Jive, he mixed multi-platinum hits for Britney Spears, Backstreet Boys, Joe, R. Kelly and Aaron Carter, and platinum and gold hits for Jazzy Jeff & the Fresh Prince, LFO, Aaliyah and Hi Five. "His extensive experience with a wide variety of music complements the strong hip-hop and R&B backgrounds of our other engineers," notes Tabasinske of SOS. Current Credits: In June of 2002 SOS Management has signed Chris Trevett to its select talent roster. Trevett has demonstrated his diversity in projects ranging from rap to gospel to pop and R&B, working with Britney Spears, Backstreet Boys, Joe and R. Kelly. "Chris's discography is filled with the biggest records of the last five years, including the multi-platinum albums, Oops...I Did It Again and Baby One More Time for Britney Spears; Millennium for Backstreet Boys; and My Name Is Joe for Joe," says Mira Tabasinske, manager/production coordinator at SOS Management. "Chris' work speaks for itself, but, as a staff engineer at Jive until recently, his name hasn't been well known. It's our goal to showcase Chris' already impressive credits and generate exciting new ones." "I've been fortunate to work on a lot of great records over the years," says Trevett. "Now, instead of making hit records just for Jive, I'll be able to make hits for many more artists. Recently Trevett reunited with multi-platinum pop sensation Aaron Carter and the soulful Syleena Johnson on their respective new albums and contributed songs to the debut album of R&B singer Nivea.